It’s time for Random Acts of Kindness Week, which is celebrated today through next Sunday, Feb. 17. Consider focusing a little time on showing kindness to others in either small or big ways, and join in on a national wave of spreading cheer. If you’re looking for some prompts to get you started, we have an entire page dedicated to kindness called Be Kind: Kindness Ideas. The page includes links to past articles I’ve posted on the topic, as well as links to organizations that feature hundreds of ideas. The Random Acts of Kindness Foundation (RAKF), the official organizer of the week, has a great page with an idea for every day of the week, plus free downloadable book marks and cards. 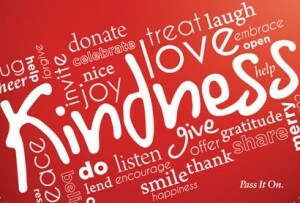 Don’t miss its extensive list of kindness ideas for this week and all year round. Check back with Good Neighbor Stories each day this week for more ideas and inspiration. And if you attempt some acts of kindness yourself—or are the recipient of some kindness—share it with us in the comments, or on our Facebook page! 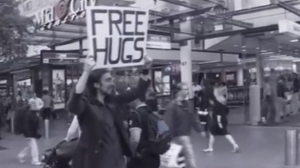 From the "Free Hugs Campaign" YouTube video. 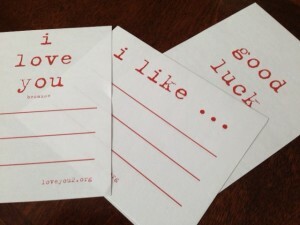 In honor ..
A few of Shannon Weber's loveyou2.org notes. Sometimes I ..